Going to Las Vegas? Got marriage on your mind? Go for it! 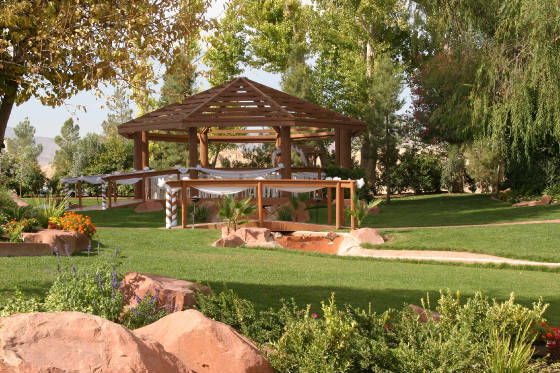 Las Vegas wedding chapels offer you the most stress-free wedding you’ll find anywhere. They are the wedding experts. You can download onto their shoulders all the hassle that normally precedes a wedding. And you will be in good company. Some of the biggest names in entertainment have exchanged rings in a Las Vegas. In total, there are dozens of Las Vegas wedding chapels to choose from, with prices geared to every budget. But be prepared, if your vision of a wedding includes the bride floating down a mile-long aisle in a majestic building with vaulted ceilings and the ceremony stretching for an hour, Las Vegas wedding chapels are not for you. 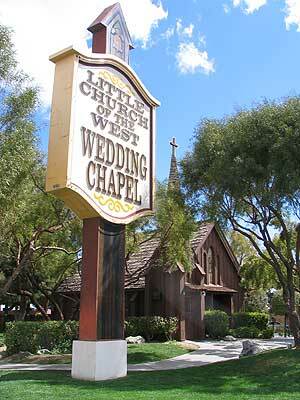 The most historic of the Las Vegas wedding chapels (some have been marrying couples for 50 years or more!) are tastefully decorated but small and intimate. A bride could make it up the aisle in less than 30 steps. And the minister will guide you through your vows at a time-efficient pace, normally ranging from eight to twenty minutes. But fear not, your ceremony in a Las Vegas wedding chapel will be personal, loving thoughtful, and most important, legal! If a traditional wedding rehearsal is important to you, please check that this is possible with the chapel before booking a time. There is such demand for weddings in the best chapels that rehearsals are often out of the question. But on the positive side—Las Vegas wedding chapels are well prepared and the ceremonies well structured that a rehearsal is not a necessity. If you find a Las Vegas wedding chapel that appeals to you, we suggest you do your research to ensure that your day isn’t ruined because it flew by too quickly. Here’s our list of things you will want to know. * How many weddings a day are performed on average? * Do we have a choice of a civil or a religious ceremony? * How long does the service take? * How many people can the facility accommodate? * When can we arrive with our wedding party and how long can you linger afterwards? * Can photography be taken before and after the service at the venue? * Does the chapel insist on using its own photographer? If so, what is his or her wedding photography experience? When can you view a portfolio of previous wedding shots? * Do we have a choice of ministers? Can you bring your own minister if you wish? * Can we watch a live wedding ceremony before you commit to booking the chapel? * Are language translation services offered? * Does the chapel provide limo service to and from the place we will be staying? Once you have the answers to those questions, you should have pretty clear idea if a Las Vegas wedding chapel is the venue of your dreams. Some of the Las Vegas wedding chapels can be found on the Strip in the middle of the Las Vegas action. Others are a short distance away where you can escape the glitz and gnarled traffic. Both options are available and most chapels offer limousine service to and from your hotel. Do you want bragging rights that you were married on the strip in the very same Las Vegas wedding chapel as your favorite movie star? 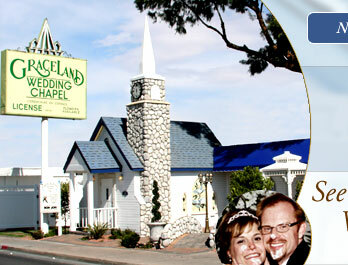 Las Vegas wedding chapels are eager to provide you with the names of famous couples who tied the knot in their spot. Located a short limousine ride north of the Strip, the Grove can accommodate up to 250 people in a peaceful oasis where you can exchange wedding vows against a backdrop of mountains and the sounds of nature. The Grove’s outdoor wedding chapels are situated on over three acres of gardens, ensuring you the privacy and elegance of a magnificent ceremony. A canopy of trees protects you and your guests from what can be a make-up melting Nevada sun. Don’t wrinkle up your nose at the tree-height, blatantly Las Vegas-style sign that marks the location of the Little White Wedding Chapel. It claims to be known around the world as THE PLACE to be married in Vegas. Once you get past the sign, you will step into a charming, intimate chapel where you can exchange wedding rings with joy. The Little White Wedding Chapel has been in business for over 50 years and has witnessed the marriages of many stars. From a long and illustrious list, some who married here include Paul Newman & Joanne Woodward, Dean Martin, “Slash” (Guns & Roses) and Dixie Chicks’ Natalie Maines. Michael Jordan and his wife-to-be, Juanita Vanoy, arrived unannounced with four guests in a taxicab dropped in without an appointment for a 2:30 am wedding. History garners no respect in Las Vegas. The Desert Inn, home of reclusive millionaire Howard Hughes, was flattened and replaced with Wynn’s. The Sands, where Sinatra and the Rat Pack entertained thousands, was imploded and the Venetian rose up its place. The old Aladdin, where Elvis and Priscilla exchanged vows, was destroyed and rebuilt bigger and better. So you have to ask, how did a simple Las Vegas wedding chapel survive in the same spot for over 50 years? By sticking to what it does best—marrying people in a style so caring and professional that it’s reputation has made it a landmark Las Vegas wedding chapel. This old-fashioned wedding chapel is one of the few free standing Las Vegas wedding chapels conveniently located on The Strip. If you cherish the idea of being married in a Las Vegas wedding chapel with history, you might consider the quaint Little Church of the West, serving the public for 65 years. It can boast that it has married more celebrities than any other chapel in the world. From Betty Grable & Harry James (the first celebrity wedding in 1943) to Zsa Zsa Gabor, Judy Garland, Mickey Rooney and Dudley Moore. While Elvis Presley and Priscilla exchanged vows at the Aladdin, it was in the Little Church of the West that he and Ann Margaret vowed to cherish each other in the film Viva Las Vegas. Little Church of the West holds the honor of being the only place on the Strip listed on the USA’s National Registry of Historical Places. Decided to get married in Vegas? Our Vegas Wedding Guide tells you all about the legal requirements for a Nevada wedding.